George Gray first clocked in at the Gulfarium in 1972–he was a 17-year old kid looking for a job. 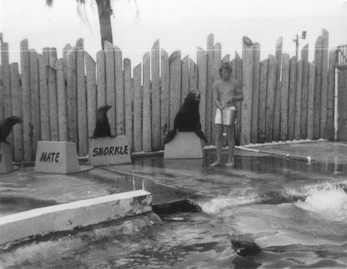 Just two years later, his job would be Show Director of the park’s popular dolphin show. George was born to do shows at the Gulfarium. Trainers who worked with him all marveled at his incredible showmanship. 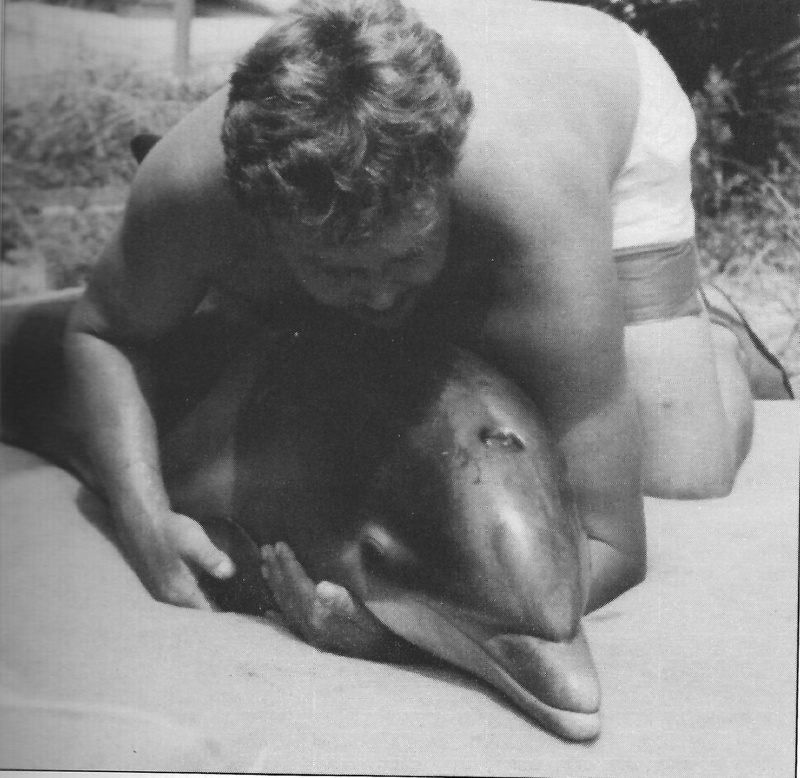 George credits his success in the shows to the dolphins: Herman, Princess, Misty and Delilah. And that’s just the kind of guy you meet when you meet George Gray. He’s worked with animals his entire life, and he says he’s loved every job he’s ever had. He considers that fact of his life a divine gift. There’s no doubt that George has a gift for working with animals, and he’s put that gift to great use. Over his many years at the Gulfarium he was an active member of an animal rehab team that helped dolphins, sea lions, false killer whales and anything else that stranded along the northern Gulf coast during his 20+ years wearing the Gulfarium shirt. George worked with the U.S. Coast Guard on an out-of-the-box plan to free a submarine-sized baleen whale stranded in Pensacola Bay, a rescue documented in the book. Inspired by an influx of dolphin strandings in the 1990s, George retired from the Gulfarium to open the Emerald Coast’s first dedicated facility for marine mammal and sea turtle rehabilitation–Emerald Coast Wildlife Refuge. “I wanted to make sure that stranded animals would always have a place to go,” George said. George Gray’s stories run throughout the book. We couldn’t have put this project together in the way that we did without his input. The process that began nearly a year ago has come full circle as Images of America: Gulfarium Marine Adventure Park hits shelves today, January 12, 2015. On this site you can follow the progress of our book signing tour, get a little insight into the making of the book, and of course order your discounted copy from the authors themselves! We thank our family and friends for the support along the way that helped make this book possible. Your hearts are in this work as are our blood, sweat and blistered typing fingers! Check back for book signing dates as we add them to the calendar on this page.